Green radish is the evergreen vine of Araceae. Stems are thicker and stronger, with aerial roots on the nodes; leaves ovate-shaped or ovate-elliptic, dark green, irregular yellow streaks or plaques often present on the leaves. (1) Green radish is more resistant to negative, and can be cultivated indoors all year round. Spring, summer and autumn are placed near the well-ventilated things or the north window, and in the winter, they move to the south-facing window, so that they see more sunshine, the leaves are green. 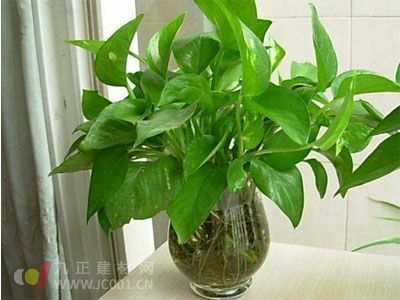 If the flower pot is placed in the light too dark for a long time, it will not only cause the vine stem to grow long, the internodes become long, the plant shape is thin, and the yellow and white stripes or plaque on the leaf surface will become smaller and pale, even color. The spot completely disappeared and returned to green. If you put outdoor culture, you should pay attention to shading, especially in the summer to prevent strong light, otherwise it will lead to new leaf shape, dark leaf color, and easy to burn the leaf edge. (2) The growth temperature is 20~30Â°C, and the winter room temperature should not be lower than 15Â°C. (3) Green radish is moist, watering in the growing season is always necessary to keep the soil moist. It is not necessary to dry the basin, otherwise the yellow leaves and the color are not good. If too much water is used to cause water in the basin, it is easy to cause dead leaves and dead leaves, especially when the room temperature is low in winter, it is necessary to pay attention to controlling watering. While watering in the summer, pay attention to the water spray on the leaves. In the northern winter, the climate is dry. It is necessary to spray the leaves with warm water every 5 to 7 days to wash away the dust on the leaves to help keep the leaves bright and green. (4) Because of the rapid growth of green radish, it is necessary to apply a thin liquid fertilizer combining nitrogen and phosphorus every 2~3 weeks during the growing season. (5) Young plants should be replaced once a year, and the plants can be changed every other year. Potting soil should be selected from humus soil or peat soil, garden soil, plus 1/5 river sand mixed to prepare the culture soil. Green radish can also be cultured by hydroponic culture. When hydroponic culture, pay attention to changing water once or twice a week, and apply 3~4 times of thin compound fertilizer during growth. It was found that the yellow leaves should be cut off in time, and other management methods are the same as those of potted plants.